Just another day at the office? Not quite. For the many creative new startups, entrepreneurs and international business travellers who choose co-working hub Cartel House as their base, the word “office” has taken on a whole new meaning. We’re definitely not talking the bland old desk-and-internet-connection kind of shared office here. We’re talking the German luxury supercar of co-working spaces. You know, the hit-the-gym-on-the-second-floor-before-work kind of office. With the app where you can order your single-origin coffee or granola health breakfast delivered straight to your desk. 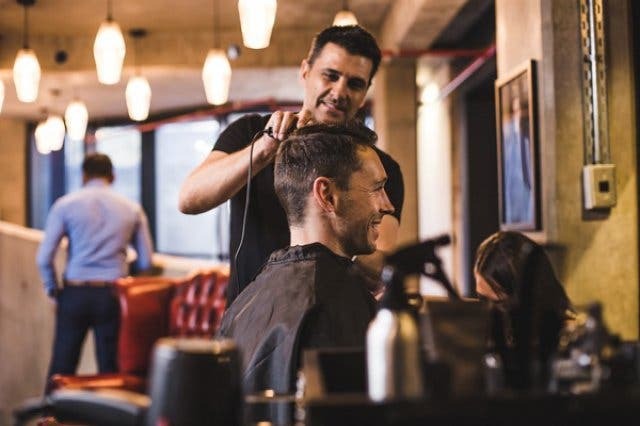 The in-house barber next to the tailor that does handmade suiting and alterations kind of office, with the super-luxe common areas and free library, the stunning inner-city views and spectacular rooftop function venue. 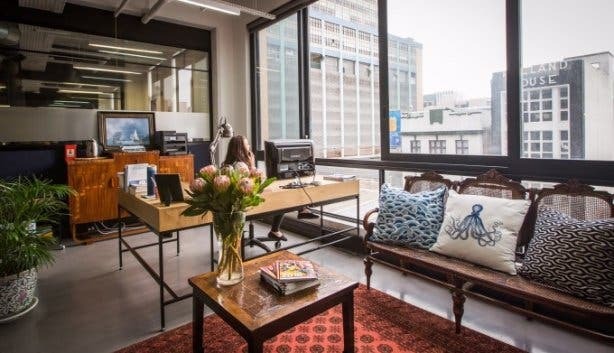 The kind of office that attracts Cape Town’s (and the world’s) brightest and finest. “The best part about moving our offices to Cartel House is that now you’re also right in the hub of some of the city’s most creative minds,” says CapeTownMagazine.com founder Marcus Zandhuis. “If your business needs some kind of new service or technology, just pop your head out of your office and you’re almost guaranteed that there’ll be some bright young startup next door that specialises in doing exactly what you’re looking for,” he adds. Cartel House at 113 Loop Street (where else?) is the flagship location of unique city office environment creators, Inner City | Ideas Cartel. And, what makes this location unique is that it offers the complete business-leisure (the so-called “bleisure”) lifestyle package. 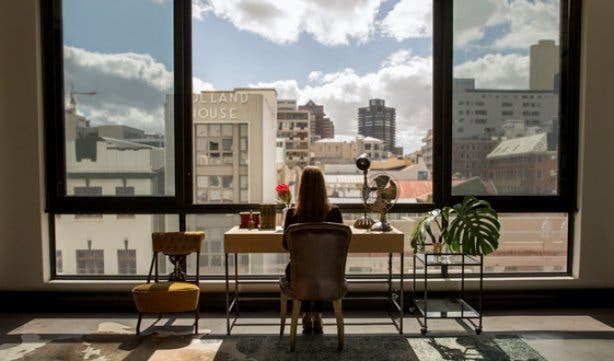 It’s ideal for both the new startup entrepreneur and the established business person looking for an office away from the office (think gym, gourmet food, luxury office spaces and that epic rooftop venue). 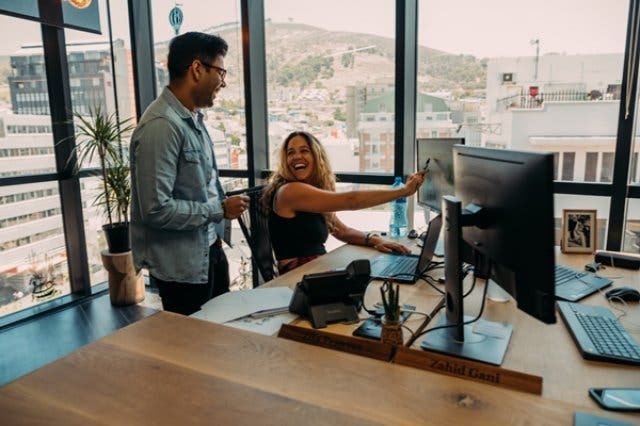 But it’s just as suitable for the international traveller looking for a one-stop-shop of bleisure facilities, a central CBD location with everything you might need to conduct a bit of business during your Cape Town stayover. Tip: Keen to check out the facilities before you commit? Make use of the Cartel House Monday Day Pass special. One of the highest rated tailors in the city, Lock Stock & Barrel, are available for fittings in your office by appointment only. Book and the tailor will come to your office to measure and outfit you. Also available are full barber services by Blokes Hair. Again, all you do is book and the barber will come to you. Plus: Ladies hair and treatments like manicures and pedicures are also available to members. Another reason to purchase your Cartel House membership. At Cartel House, there’s no standing in lines during the busy lunch hour rush or breaking your concentration to get that caffeine fix. The in-house app lets you do everything from ordering coffee and meals to booking your gym sessions, boardrooms, function venues (including the amazing rooftop facility) and grooming appointments quickly and easily – so you can focus on your business. In the near future, you’ll be able to book your accommodation (oh, yeah, did we mention that Cartel House is launching a hotel in the building soon?) and transport from this free-to-download concierge app. 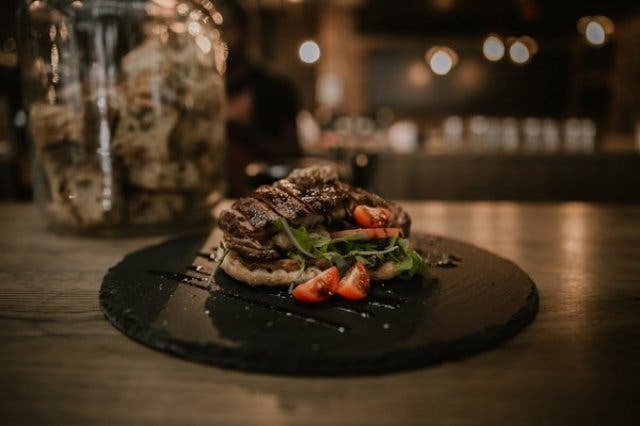 Of course, the flagship outlet of exquisite French-themed restaurant Café du Cap is housed on the ground floor of the Cartel House building – they’re famous for great coffee and fantastic make-your-own R55 lunch salads. But, with in-house Cartel Coffee bar on the third floor, you can also get an excellent flat white (served by some of the most delightful and experienced baristas in the CBD) and your lunch delivered right to your desk. The in-house food, ordered through the mobile app and powered by Source Food, is best described as uncomplicated gourmet. It’s good, familiar food – think beer-battered hake with skinny fries and homemade tartare, honied quinoa with roast butternut and marinated chickpeas, decadent gourmet steak sandwich and Thai beef salad – but it’s painstakingly prepared and beautifully presented. So much so that you’re as comfortable in ordering it for lunch as you are with having it served to an important business liaison. What’s more, you get access to fully fitted kitchen spaces, complete with fridges, microwaves and pod coffee machines. You know, for prepping your own lunch. And you can enjoy it at any of the super-comfy couches and seating in the beautifully decorated communal spaces – complete with a free library for your reading pleasure. Tip: Don’t pack breakfast on Fridays, because that’s when Cartel House serves all its members free flapjacks on Fridays. 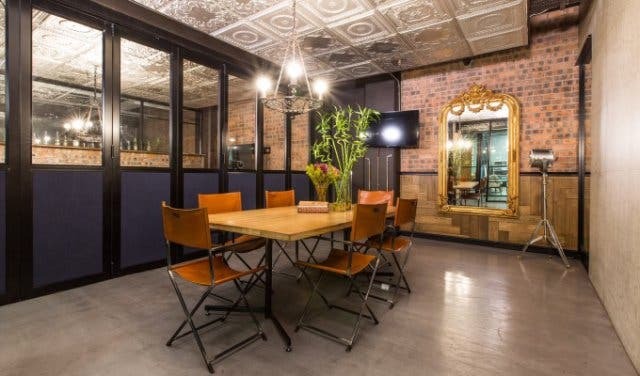 Cartel House is perhaps the only space in Cape Town that gives you the option of booking either a 6–8 seater boardroom, complete with flat-screen TV and both Mac and PC connectability, or upscaling your boardroom booking to facilitate up to 20 or 40 people. And, if you still need more space, there are loads of rooftops for film shoots and functions. 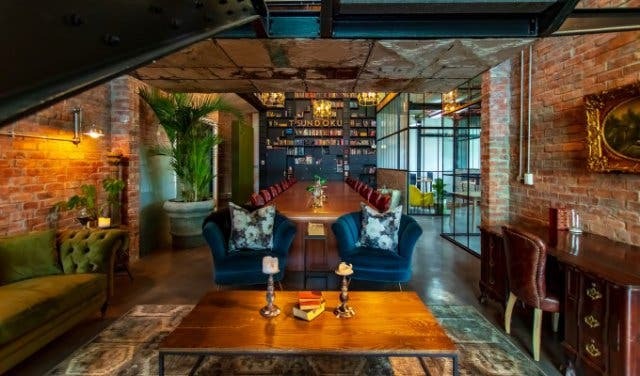 The Cartel Rooftop in Waterkant Street is fully-kitted with a rooftop bar and kitchen, making it ideal for everything from weddings and photo shoots to product launches and corporate events. What's more, there's also an auditorium int he same building and the team can help you plan and execute your event here, too. The Cartel House rooftop (on levels 10 and 11) at Loop Street features an incredible view of the city and the Table Mountain that makes it ideal for film and photo shoots. Enquire about booking any of these rooftop and events spaces by emailing innercity@ideascartel.com. With all the awesome lifestyle features on offer, it’s probably worth reminding you that Cartel House is a luxury co-working space – or a “five-star office hotel” as the founder likes to call it. That means you have your choice of co-working spaces, private offices and premium serviced company office – all with lightning-fast internet, a business address and shared reception areas. Check out their suite of shared office solutions. 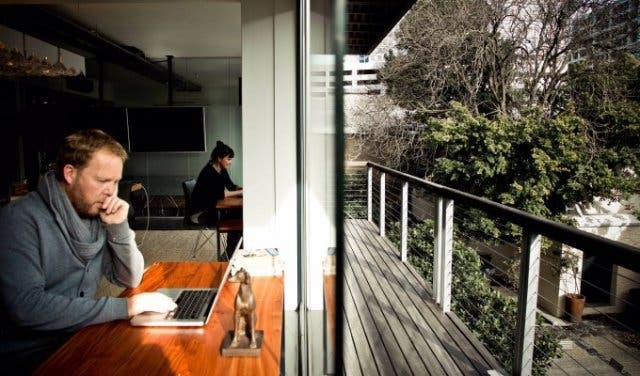 Tip: Day passes are available, but the boxing clever way to get the complete Cartel House experience is to get yourself a co-working space with full Cartel House membership for only R4000. 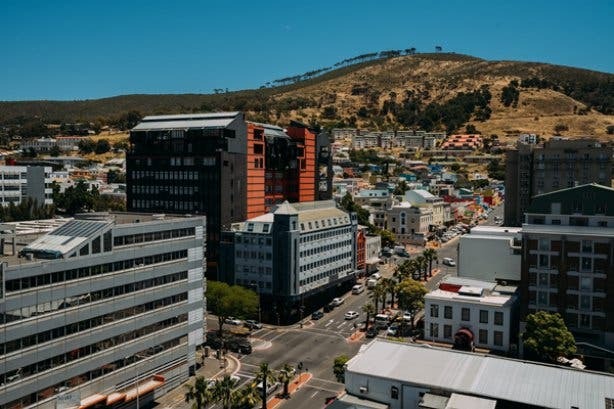 Celebrate the entrepreneurs in our city at Cape Town Start-up Week. See our roundup of all the most unique co-working spaces in Cape Town. Looking for sushi or Asian food nearby? Check out new place Tomo Japanese restaurant. If you are looking for business accommodation nearby, why not try out one of Afribode Accommodation's luxury apartments.